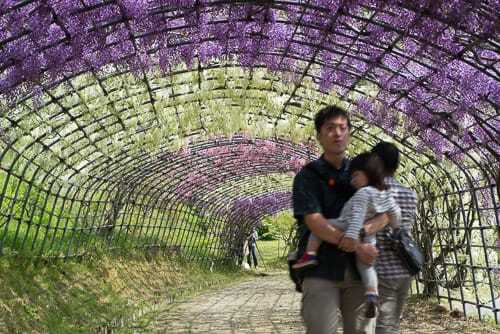 The Kawachi Fuji Garden is one of those hot spots / places to see before you die locations in Japan. 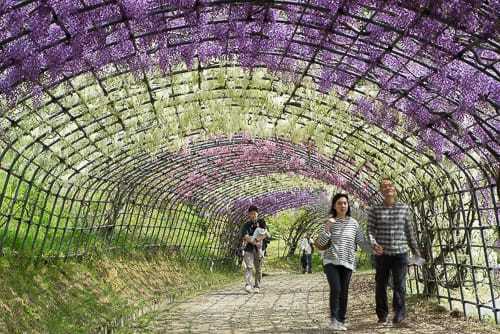 There are two tunnels, a dome, a small trail and an additional Fuji flower rack at this location. it really is pretty cool and very photogenic. Although I was about a week early to get the full Fuji flower blast, the location was still very beautiful. The only problem is places like this are often times very crowded in Japan, especially in the spring. So shooting around the crowds can be difficult and it requires a bit more work. In this case, it took shooting several shots that I then to combine together to get one clean, people free image. It's a simple process and can really save your shot when traveling to those crowded locations. 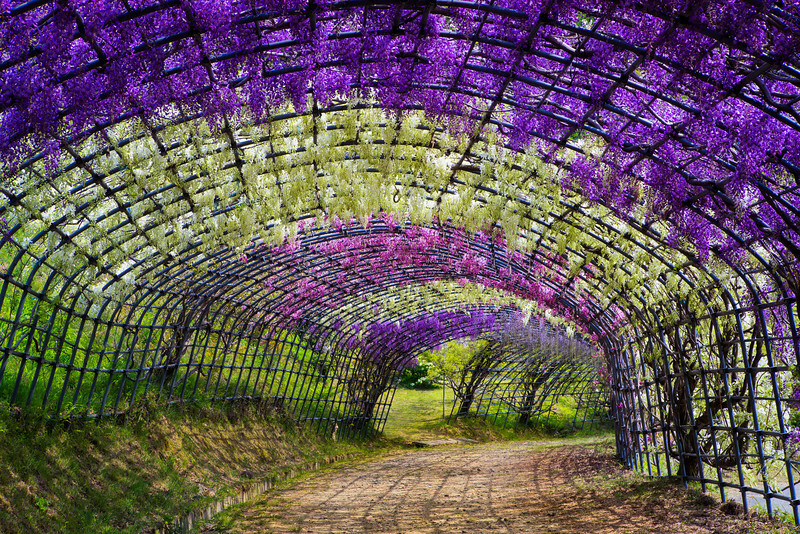 When I first started shooting at the Kawachi Fuji Garden tunnels I was thinking ultrawide 14mm. But because of the low density of the Fuji flowers from being a week early, it was only accentuating the lack of flowers. By the time I switched to my 24-70mm the crowds had swarmed in and I couldn't catch a break. Shoot several shots and blend them together in Photoshop. On a tripod I took a series of shots that were filled with people. Trying to keep a mental image of where people were or were not standing. However, there were some other photographers that camped out at the end of the tunnel during the process and they would not budge. So my wife kindly asked them if they could move over a few feet for a few minutes to get the final piece I needed. My wife is awesome btw. I would have just waited them out, could have taken forever. The final shot only took me a total of 4 images. I simply layered them together in Photoshop and used layer masks to paint in the areas I wanted. Some of the shots fell under shadows from clouds so I had to lift them separately with the curves adjustment tool. And because I used layer masks blended with the brush tool, I could feather the tiny differences between shots without them being noticeable. By the end, the only part I had to clone stamp was part of a tripod leg and one of those photographers feet. Once that process was done, I processed the image as normal. In this case mostly just some curves and saturation. All entirely in Photoshop. I used Lightroom to do my final exports and fill in my metadata.